Today you have the privilege to let your voice be heard, to cast your vote. Twenty-four states have had their turn, and today it is yours. I feel far away and helpless today (both of which are actually exactly what I am, ha!) but as I was laying in bed during the early hours of this morning, unable to sleep, my mind was racing, thinking over the seriousness of today and wishing I could be there, in your states, campaigning, doing something. And then I was reminded that God just asks me to do my part, what I'm able and available to do, and leave the rest up to Him. Well, currently I am in Mexico, so I had to think of what other methods of influence are available to me at this point. 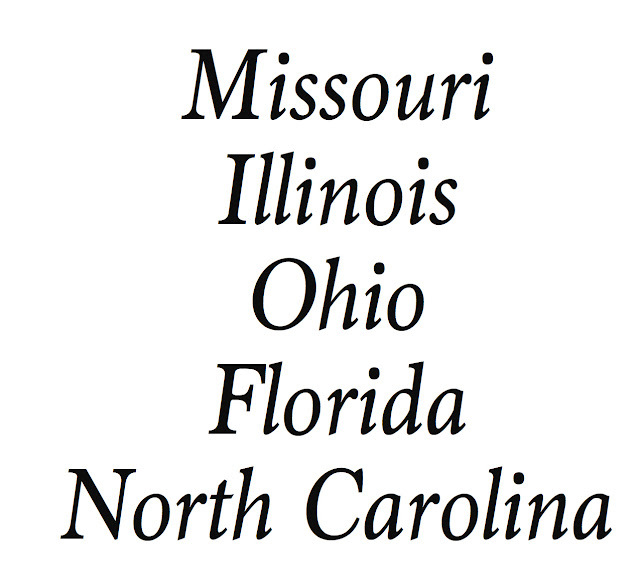 Out of all my instagram + blog followers, there are most certainly some of you who live in one of these five states that the whole country is watching today. Say there were five of you who weren't planning to go vote, and after reading this you changed your mind and went to the polls after all. Say you each took a friend or a spouse or someone with you. Suppose you were able to change their minds and help them to vote biblically? And then let's just say that even just a few of you went and posted on your social media to encourage your followers in those states to get out and vote biblically, and say five of you were able to influence the same number of people listed above? Do you realize how fast these numbers multiply?! Very quickly! And all by just a few faithful people doing their part for Jesus and their country. This "grassroots" term is a biblical principle, friends! It has built the Cruz campaign from the very beginning and I have been inspired by meeting and hearing about literally thousands of people who have come together for this common cause over the past year, all committed to giving their little for something great; a godly man as our president. So for starters. Just to clear the air. Hillary Clinton and Bernie Sanders are not even on our radar as Christians. Not.an.option. Moving on. Rubio and Kasich are not options either, for a number of reasons that I could go into but won't for lack of time and lack of need. The most important thing at this point for you to know about them (if you don't know this already) is that it is virtually impossible for either of them to win, even if they were to both win their home states today. They both have so few delegates that they just aren't even viable concerns, so please don't waste your vote on someone who can't win. This leaves us with two men. These two men are not merely two different men. They are opposites. I cannot think of any other two examples that have such completely contrasting world views, principles, and agendas. When thinking of the two of them this morning, the verse that came to my mind was Ephesians 6:12, "For we wrestle not against flesh and blood, but against principalities, against powers, against the rulers of the darkness of this world, against spiritual wickedness in high places." That verse could not be more appropriate for this time. The battle our country faces today and indeed this whole election, is wickedness against good. It is the Kingdom of Darkness against the Kingdom of Light. The future of our country, our families, and our freedoms, hangs in the balance. And so today, from Mexico, I pray for your states, that God would work a miracle. Because this world hates righteousness, and darkness seems to be prevailing. As Senator Cruz told my father and others on a campaign conference call on the first day of this year, "If I have a chance in this election, you will see assaults come at me and my campaign from every side and angle. And if you see that, you will know that this campaign has a chance, and has the hand of God upon it. But it will only be possible to win by the power of God and by the prayers of His people." The media and even much of so-called evangelicals hate Senator Cruz. Truly, the attacks against him have come from all sides over the past two months. And yet God is blessing his campaign and working revival in the hearts of Christians who are rising up from their apathy to take a stand for Jesus! Will you join the soldiers of Christ, to not only cast your vote for truth, but to each use your sphere of influence to challenge others to do the same?! May HE be glorified as we pray and do our part! Amen, Chels. Amen. I don't need to add anything to what you've said. You hit the nail squarely on the head. It more entertaining if I picture you reading this out loud because you, like me, get worked up and passionate. I also picture Allison adding running commentary on how you should have said this or that and being the verbal copy editor. Many blessings on all of the family's continued work in Mexico. As always, I'm praying for you all. Love this. Even though I'm not in this group of voters, I reposted your post on Twitter so hopefully someone will see it:) your thoughts were very well written!!! Thank you for doing your part!! Thanks for all that y'all did! Even though I know Florida didn't turn out like we would've hoped, still it is a good feeling to know that we followed the Lord and did our part! This year is my first time being able to vote, and I'm excited and honored that in my first time voting I can stand with a man who is born again and seeks God for guidance, defends the Constitution, and has conservative values...Ted Cruz! =) He has my vote in NC! Thank you, Chelsy, for standing up for truth in a time when truth is scarce. Blessings to you! Amen! So exciting that you could have a candidate to BE PROUD OF on your first time voting! All glory goes to Jesus-we are just wanting to do our part and have no regrets! What will you do if Trump becomes the Republican candidate? Vote for him or not vote at all? I wouldn't even consider voting for him. In almost every situation I would normally say that as Americans we have a duty ultimately in the general election, to vote for the lesser of two evils. But honestly for me if it was down to Trump vs Hillary there would be no lesser of two evils. They are both almost equally two of the most dishonest, immoral, corrupt, ungodly, and wicked candidates possible. I believe with all my heart that Trump is a modern day Hitler, and time will only prove to confirm this. As such it would be absolutely impossible for me to vote for him with a clear conscience before the Lord. I can tell you that there are many, MANY Christians I have talked to who agree with me completely and would never vote for Trump even if he were the republican nominee. We must rise up and pray like never before that God would work an absolutely miracle so that we do not have to see the final election being down to two people like Trump and Hillary. The more I think about the populist nationalism that DJT has latched onto, the more I tend to agree with you Chelsy. It makes my skin crawl, but those of us that are believers need to pray and we need to stick together to make it through this. Our safety and voice will come in numbers. I might add that I will not "not vote". I will write in Ted Cruz or vote for an acceptable 3rd party candidate. We must always participate in our local/county, state and down ballot races. Brandon and I were literally just talking about this! We said that if it was between Hillary and Trump, we could never vote for either as Christians. We never thought not voting or writing-in a candidate was a good choice, but now see it as the only choices if that's how these elections work out. We were also saying how thankful we are that your family suggested setting aside Fridays to pray and fast. It has led us into deeper and more frequent prayer with the Lord and every time we feel overwhelmed by the state of our nation or the going-ons of the election it's such a natural response for us to immediately go into prayer over these circumstances. And thank y'all so much for joining in prayer + fasting! We have been so encouraged to hear of all the people who are doing this! Chels it is funny how I have read that you say Trump is a modern day Hitler. I have said that myself. I have even been to some of these states that supported Trump & said "Hio Hitler Trump". My brother and sister and I went out to the polls for 12 hours today to talk to people about voting for Cruz!! It was really great! Still watching for the results for MO and it looks like Cruz is getting closer and closer to Trump... still hoping for a win! God can do great things! Praise the Lord-thank-y'all SO MUCH for doing your part!! I was hoping the post title was referring to y'all adding more tour dates. ;-) I'm in MO! Saw your post a little too late, although we're not registered to vote anyway... *shrug* It's just interesting to follow this crazy "circus" though! Realistically, Cruz can't get enough delegates at this point either... (Would need HUGE (said like Trump) wins.) So the most others can do is try to stop Trump. Ted Cruz needs to have great days, for sure, to win the nomination but he is the only one that can do it outside of the Combed Over One. As someone close to the campaign, I do know that we are doing all in our power, all the while praying and asking God to provide for us. Like Chelsy said in a previous response, I truly believe that DJT is evil. There is a group of psychologists that wrote about DJT being a narcissistic sociopath. I tend to agree with them. He has no issue completely contradicting himself and he sees no problem when he does. The fact that many believe him leads me to believe that we have too many ill informed and frankly(there's an inside joke here) willfully ignorant people voting in this country. Many things are to blame but the state of our education systems and the state of our churches are a good starting point on where to place blame. We need to pray for true revival and that people would open their eyes to see and open their ears to hear what is needed. Hope I wasn't too forceful but Chelsy knows where I'm coming from. Thanks for the encouragement! I'm thankful if something here can be a challenge to others! I wasn't able to vote -I'm 17 and realized I could vote, but missed the deadline by about 4 days sadly :'( However I will be voting this NOvember, Lord willing. I will be supporting Ted Cruz (thank you for all your posts about him! That helped impact my decision). Praying for our country today and ever day! So thankful if something I posted could encourage you in voting/supporting a candidate biblically! Amen to the prayers-our country needs it! Thanks so much, Chelsy, for the post! You really expressed my emotions! I'm from Illinois! =) I'm so glad that there are other other people that believe like me, trying to do what we can for God! Even if it is Trump or Hillary that becomes president in the end, it shouldn't matter! We still need to trust ONLY. GOD. NO. ONE. ELSE. Because HE is the ONLY one that is in control of this evil and wicked world! I really appreciate your blog...I admire your faith and everything else about you! I love hearing your family sing...you guys are blessed with such a talent! Well, trust God no matter WHAT happens in this 2016 election! I trust that we will still do our part, but still let God take over! Thanks so much for your ministry! And amen to what you said-no matter who wins, I'm thankful to know that God is still on the throne! Hey just one question...who plays the violin on your new cd, the song Blackberry Blossom? The second time is Allison, right? And the first time you play it, is it Denver? Thanks and hope you're enjoying your time down south! Hey Chels, just another question! =) I play fiddle and I'm just wondering which book Allison learned the Orange Blossom Special out of! I'm just wondering if she plays a different version than I do! She so good at it! =) I play the Orange Blossom Special too, but mine is a little different! As of now, Rubio is out. Kasich has no path to victory and is mathematically eliminated from contention. He's trying to end up as the kingmaker at the convention. John Kasich is also a tax and spend big government types of guy who has cozied up to big government issues like expanded Medicaid and Common Core. Those issues run contrary to free market and limited government principles. He also has been morally bankrupt on issues of religious liberty. The Kim Davis issue in Kentucky is a prime example. Bernie is an unrepentant socialist and would serve to limit individual sovereignty in this country. Hillary is much the same but in a more veiled manner. Both think that government needs to control your life. The only fair government is one that leaves the citizens alone to live their lives as they see fit. No mandates. No directives. Trump is a whole 'nother can of worms. Frankly(this is an inside joke), he's stirred up a movement of hate and vitriol the likes of which I've never seen. He is a caricature of what the left thinks of conservatives while being anything but. As a Christian Conservative, I know that none of Trump's positions jibe with my own. He doesn't value individual liberty or free religious expression. He has sold people an empty bag of hate and anger. Chelsy knows that I agree with her. I'm just explaining to anyone else and responding to the above comment. We need to be in prayer for our nation every single day. This country was not made into the exceptional nation it became by the virtues of any single man. Only by God's Providence were we allowed to prosper. The nation wasn't perfect but we kept moving toward better ideas and more liberty and where there is liberty and freedom to exalt our Father in heaven, He blesses us. We must not let these ideals perish. I reiterate, no man can make us great, only God can. Choose a candidate that will get government out of God's way. So now that Trump will most likely be the Republican candidate I assume you or your family or other conservatives that you mentioned will not be voting in this presidential election per your reply above. You stated that you and many other conservatives would never vote for Trump or Hillary. I can't answer for other people. My family is somewhat divided; some are still praying about what the Lord would have them to do. This is very much a personal decision for each of us; even though we are a very "tight" family, we each realize that we have to answer to God for ourselves and have to make that decision on our own. So I can't answer for other conservatives or the rest of my family. But I can answer for myself that I could never and will never vote for either Hillary or Trump. Knowing everything that I know about their personal lives and background, there is no way I could vote for either of them. I will not judge someone else who does; that is between them and the Lord. I'm just speaking for myself. I know too much about them to be able to give them my vote with a clear conscience. I will still get out and vote, absolutely-I believe that is my Christian duty. It is very hard to know that there is nobody that I feel I can vote for who has a chance. (obviously as the only option left would be third party) But that is what it is-I did my part to do my best to get a godly man in the republican party but at the end of the day there just weren't enough people willing to stand up and fight for truth, and the result is the candidates we are left with.